Heat oven to 375°F. Spray large cookie sheet with cooking spray, or grease with shortening. 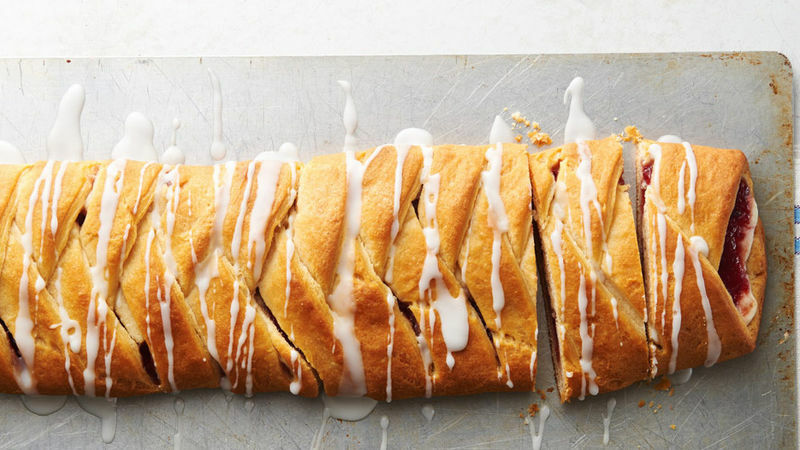 If using crescent rolls: Unroll dough into 2 long rectangles. Place dough on cookie sheet; overlap long sides to form 13x7-inch rectangle. Firmly press perforations and edges to seal. If using dough sheet: Unroll dough; cut into 2 long rectangles. Place dough on cookie sheet; overlap long sides to form 13x7-inch rectangle. Firmly press edges to seal. Spread cream cheese in 2-inch-wide strip lengthwise down center of dough. Top with preserves. Make cuts 1 inch apart on each side of rectangle just to edge of filling. Alternating from side to side, fold cut strips of dough at an angle halfway across filling, slightly overlapping ends. Bake 18 to 22 minutes or until golden brown. Cool 5 minutes; remove from cookie sheet. Cool at least 15 minutes. Meanwhile, in small bowl, mix powdered sugar, milk and almond extract, adding enough milk for desired drizzling consistency; mix well. Drizzle over warm coffee braid. Store in refrigerator.